Notes: Dixon #33. Bar Rep. 31. Butler Round Hill S.E. 3 - Vol. 4. Map 65.3 (diagram of cists alongside the Blackbrook pp.230-1). Grinsell LYDFORD 82. 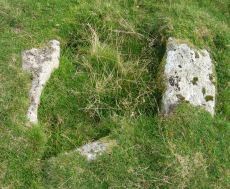 "A well defined cist which has two stones supporting the slabs in the SE corner. The chamber measures 0.95m by 0.85m and about 0.4m deep. 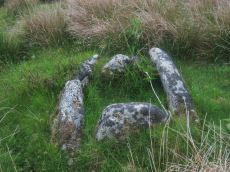 A turf-covered stony spread around the cist may be part of a robbed cairn." Lethbridge p.103 diagram Black Brook Cist(C), photo bottom p.104. Notes: Dixon #31. Bar Rep. 31. Butler Round Hill S.E. 2. - Vol. 4. Map 65.3 (diagram of cists alongside the Blackbrook pp.230-1). Grinsell LYDFORD 80. 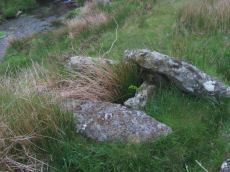 "This cist with its displaced capstone lies on the edge of the river bank. 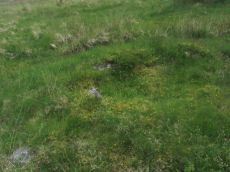 Vestiges of the small surrounding cairn are now hidden under the turf. 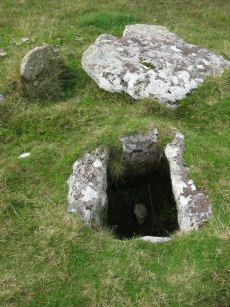 The chamber of the cist measures 1.25m by 0.55m and about 0.5m deep; the capstone is 1.5m long, 1.1m wide and 0.15m thick. The south stone has fallen outwards." Lethbridge p.103 diagram Black Brook Cist(A), photo p.103. Notes: Dixon #32. Bar Rep. 31. Butler Round Hill S.E. 1 - Vol. 4. Map 65.3 (diagram of cists alongside the Blackbrook pp.230-1). Grinsell LYDFORD 81. "The reed-filled cist is approximately 1.0m by 0.7m and about 0.2m deep. 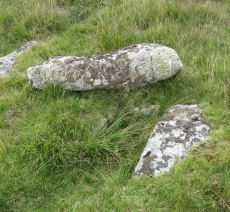 Peat has accumulated around the sides of the slabs but a few stones evident on the SW side may be part of a robbed cairn." Lethbridge p.103 diagram Black Brook Cist(B), photo p.104. Notes: Northern of a pair of cists. Butler Round Hill S. 3. (Cairn 6) - Vol. 4. Map 65.1 (p.227-9 general plan of diagram of Round Hill cairns p.228). LYDFORD 75. 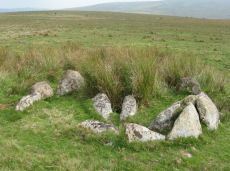 "A turf-covered cairn, slightly spread on the northern side, measuring 5.0 meters by 4.8 meters and 0.5 meters in height. 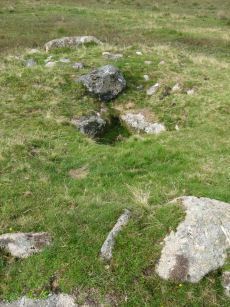 An almost centrally placed upright slab, 0.6 meters long and 0.13 meters wide and a large slab at the foot of the mound could both be part of a disturbed cist. There is no evidence of a kerb". Lethbridge diagram p.103, photo bottom p.106. Notes: Southern of a pair of cists. Dixon #34. Bar Rep. 31. Butler Round Hill S. 2. (Cairn 5) - Vol. 4. Map 65.1 (p.227-9 general plan of diagram of Round Hill cairns p.228). Grinsell LYDFORD 76. 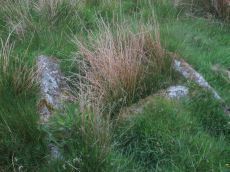 "Small turf-covered cairn with an open cist in the centre. Diameter of cairn 4.0m. Height 0.5m. The cist is practically buried under the turf now. Internal dimensions 0.85m x 0.5m. 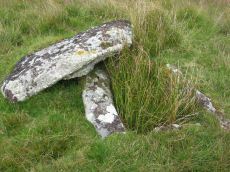 The capstone is 1.1m x 0.8m rests on the north side of the cairn. 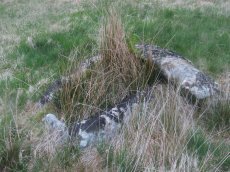 Condition of cairn and cist - fairly good. Orientation of the long axis of the cist is WNW-ESE." Lethbridge diagram p.103, photo top p.106. Notes: Dixon #35. Bar Rep. 31. Butler Round Hill Summit 2 (Cist 2) - Vol. 4. Map 65.1 (p.227-9, diagram of Round Hill cairns p.228). Grinsell LYDFORD 79. 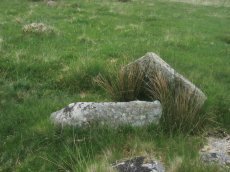 "A well preserved cist, situated on a slight east-facing slope just off the crest of a rounded hilltop. 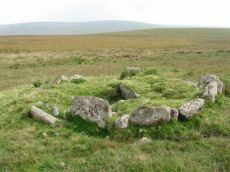 It stands in isolation on a generally stone-free area of rough moorland pasture. The side slabs are each 1.2m long and up to 0.3m thick and the end slabs are 0.55m long, 0.15m wide and 0.4m long, 0.1m wide respectively. The coverstone is up to 1.6m long, 0.9m wide and 0.2m thick. 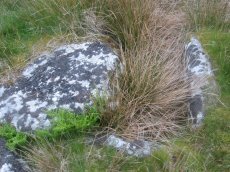 There are no surface indications of either a cairn or mound around the cist." Lethbridge p.103 diagram Cist(B), photo bottom p.105. PMD: Round Hill Summit W.
Notes: Dixon #36. Bar Rep. 31. Butler Round Hill Summit 1 - Vol. 4. Map 65.1 (p.227-9, diagram of Round Hill cairns p.228). Grinsell LYDFORD 78. Lethbridge p.103 diagram Cist(A), photo top p.105.